No matter how happy you are today, science has proven that you can improve your happiness level. Dianne Morr presents a program teaching habits that can be cultivated to make you happier on a daily basis. “Happiness is Contagious” is based on Dianne’s book Choose Happy, 25 Happiness Habits to Transform Your Life. This program is appropriate for businesses, associations, and community and social organizations. Depending on the interests and needs of the audience, Dianne teaches specific easy practices you can incorporate into your life. She has personally tested dozens of techniques for increasing happiness and speaks from experience. People in all walks of life face overwhelming stresses and financial pressures that tend to decrease their sense of well being. This program presents an antidote in the form of a fun interactive experience that also delivers solid learning about free enjoyable activities that scientific studies have proven to make people happier and less stressed. Once you have shored up your own happiness, you will find it almost effortless to spread that good feeling with those around you. This presentation is illustrated with slides of colorful photos and whimsical line drawings. Audience interaction and spontaneous humor provides laughter and an upbeat atmosphere. After a long journey through anxiety and depression, Dianne Morr set out to find the best ways to bring more happiness into her life. She became a keen student of happiness and Positive Psychology. She learned about happy people. Who are they? How did they get happy? What did they know? How did they act? What did they eat? How did they live? Who did they associate with? Dianne explored dozens of ways to bring more happiness into her life, to find out which ones were most effective. She published the results in her book, Choose Happy, 25 Happiness Habits to Transform Your Life. She is now dedicated to her mission of helping everyone she meets to claim the happiness they deserve and to share it with the important people in their lives. If you are looking for a speaker, I recommend Dianne Morr, who I had the pleasure to hear present on the topic “Happy Women Rock the World” at the Women’s Toolbox Conference. 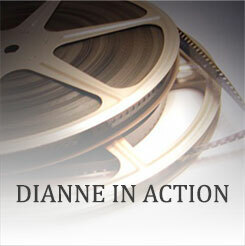 Dianne has great energy, connects well with her audience and shares valuable tips that would resonate with any group. And there’s something else. As someone in the association business who has planned hundreds of events, I know that the ability to create memorable moments is what often makes a meeting. Part of her talk included a demonstration of how to turn daily ToDos into TaDas! that can be celebrated all week long. She had the audience on their feet and smiling, and left them with a lot to think about. Please feel free to contact me directly if you would like to have a personal conversation about hiring Dianne to speak at your next event.